Saint Mary's of the Barrens Church is the National Shrine to Our Lady of the Miraculous Medal. The Shrine as you see it was added to the church in 1929-1930, by the Promoters of the Association of the Miraculous Medal, replacing an older Shrine of our Lady which had been in the church from the beginning. 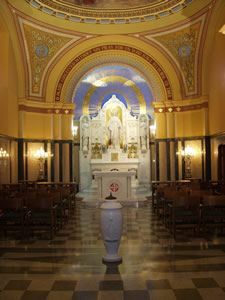 While looking at the altar of the Shrine, the elements of the front and the back of the Miraculous Medal should be evident. View the Shrine Altar close up. There is a stained glass window up and to the left of the Shrine Altar that depicts the first apparition of our Lady and Saint Catherine Laboure. In the center above the Shrine Altar is a dome painting which is a copy of a painting which was in the Motherhouse in Paris. It features our Lady as she appears on the medal and the bottom part is Saint Catherine giving out Medals to people in Paris. The second apparition of our Lady to Saint Catherine is depicted in the stained glass window to the right of our Lady's Shrine. The third apparition of our Lady to Saint Catherine. Off to the right of the Shrine Altar through the glass door is our Votive Light room. 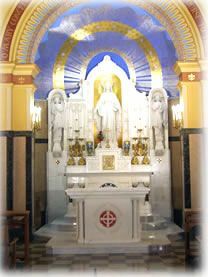 The statue above the altar and the words in the archway, "O Mary, conceived without sin, pray for us who have recourse to Thee," depict the front of the medal. The back of the medal is depicted in the base of the altar with the large "M" surmounted by a cross (through Mary's intercession we pray with confidence to God), the twelve stars symbolizing the apostles, who are the foundation stones of the Church, and the stars of heaven (Mary is Queen of Heaven). On either side of the tabernacle door are the hearts of our Lady and our Lord Jesus. 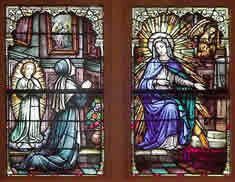 This stained glass window depicts the first apparition of our Lady and Saint Catherine Laboure's private conversation from midnight to two in the morning. Our Lady asks Saint Catherine to undergo many hardships to bring about the medal, and she agreed. 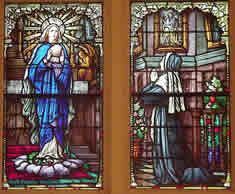 It was July 19, 1830, at the Motherhouse Convent Chapel in Paris, France. 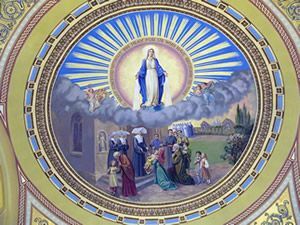 The dome painting is a copy of a painting which was in the Motherhouse in Paris. The top of the painting presents our Lady as she appears on the Medal and the bottom part is Saint Catherine giving out Medals to the people of Paris. The painting shows the poor and rich, the old and young, clerics and religious life and lay life to benefit from the use of the Miraculous Medal. The second apparition of our Lady to Saint Catherine, on November 27, 1830, is depicted in this stained glass window. Saint Catherine was asked to make a statue of Mary holding a globe. Our Lady told Saint Catherine that the globe represents the world, especially France, and the people of the world, whom she loved so much. The third apparition followed immediately. In it Mary revealed to Saint Catherine the design of the medal as we know it, with our Lady's arms outstretched on the front and the familiar twelve stars, M surmounted by a cross, and two hearts. The entire design of the medal is depicted on the Shrine altar. Working through her confessor, Catherine oversaw the minting of the medal. It was first distributed in 1832 and became popular almost immediately. 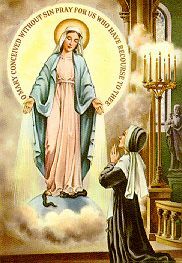 Officially known as the Medal of the Immaculate Conception, the many answered prayers and miracles attributed to Mary's intercession gave rise to the popular name, "Miraculous Medal." For 46 years, Catherine kept her visions secret. Only in the year of her death, with our Lady's permission, did she reveal them to her superior.